The Trans Wood Lock Liniment - Extra Strength is a hotter and stronger liniment and it is more suitable to uses in affected areas where acute pains are associates. Eg, pain from arthritis, rheumatism; back and joints aches; muscular aches and muscular cramps and spasms. The Trans Wood Lock Liniment - Extra Strength is also a good liniment suitable to be uses in place where climate condition is colder. 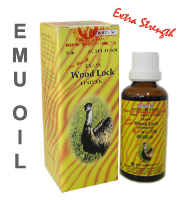 The Trans Wood Lock Liniment - Extra Strength is also manufactured in Australia as with the Trans Wood Lock Liniment (Regular Strength) are under the same strict guidelines of GMP. It is listed with the Australian Health Regulator, TGA. TGA approved no. Aust L 119820. Ingredients (per 100ml): Australian Emu Oil 15mL; Turpentine Oil 17mL; Wintergreen Oil 24ml; Ginger Oil 2ml: Camphor Oil Brown 8ml; Also contains Menthol & Capsicum Oil.INDICATION:For temporary relief of pain from arthritis; rheumatism; relief of muscular aches & pains; strains; sprains and joint pains; for injured ligaments; bruises; nerve pains; especially for lower back and neck pain; shoulders and elbow inflammation; or any sport related injuries.DIRECTION:Apply generous amount to affected areas and gently massage the liniment into the skin. May use twice daily or before bed if require.Trans Wood Lock Liniment (Regular Strength) are also available.